it seems like things have changed a lot since i crossed the sahara five years ago. 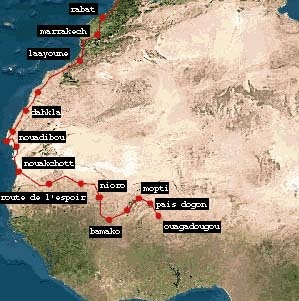 regular desert-travellers report that the last big desert-section of the atlantic route (basically the only choice available) with 4WD-only sand passages, the route from the west saharan border to nouakchott, the capital of mauritania, has been replaced by a mostly paved road easily accessible to normal 2WDs. also the time-consuming and expensive military convoy procedure in the west sahara is history. the “route de l’espoir”, a paved road connecting nouakchott with the country’s east and in terrible condition seems to have been largly rebuilt. what used to be a desert track, the connection between mauritania and mali, is now a modern, paved road, too. so in case you feel like driving to anywhere south of the sahara, you might just do that with your normal car, and it might take you a week less than it took me a couple of years ago. wow, what a progress. even the archaic border posts between west sahara and mauritania, known to be the most corrupt border in africa and for its almost two-day burocratic procedures now is a modern, clean border-crossing to be passed in no time and with friendly staff. also regular road blocks in mali now feature friendly policemen asking for your papers only, no begging and blackmailing for “cadeaux” anymore. visa and car insurance are a lot easier and cheaper to be obtained. don’t anybody say things in africa aren’t changing!